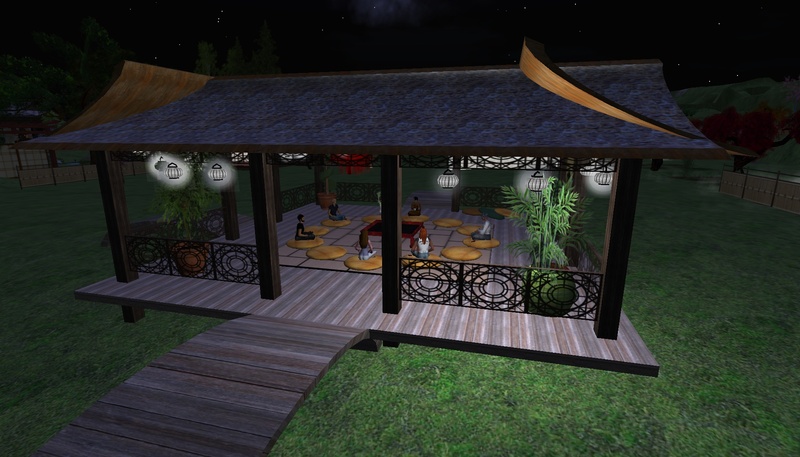 That evening, I arrived at the tea house as the first visitor. I looked around a bit, and then I saw Friedrich walking up over the bridge. Soon afterward, Maxine would join us. Maxine Walden: hi, Pema and Fred, outside? Pema Pera: inside or out, what do you prefer? Friedrich Ochsenhorn: err, either way. :-). Well, SL is a good place to start the habit again. Adams and Thorberg arrived as well. There was a lot of sitting down and standing up again. Pema Pera: well done Fred! Maxine Walden: Thor the flying goose? Pema Pera: Adams, did you get my email, half an hour ago? Friedrich Ochsenhorn: don’t move, just change your perspective ;-) isn’ tthat our theme? Lol, Fred! Solo then walked up, and there were suddenly half a dozen of us. Solobill Laville: I’ll join you! Pema Pera: not so easy . . . .
As soon as Solo sat down, Thor became restless again. Pema Pera: did you have too many cups of coffee? Maxine Walden: LOL at our antics!! Friedrich Ochsenhorn: anyone bring a hackysack? Pema Pera: Adams, did you get the email I sent an hour ago? Pema Pera: no problem at all — later! Solobill Laville: I’ll throw you a rope! Pema Pera: before long, only our heads will remain visible . . . .
Solo indeed was carrying a very nice staff, by his side. Pema Pera: Maxine and I had a nice conversation, recently, about the ups and downs of involvement with practice — any kind of practice, including PaB: at first we get excited, put a lot of time and energy in it, then other parts of life catch up, then we find a kind of equilibrium. I think we all have gone through that. Thus that “ring a bell” with others here? Pema Pera: Adams is a shining example here for all of us! Spontaneously, I introduced the notion of stages, from 1 to 2. Pema Pera: but I don’t want to prejudge, Adams! Friedrich Ochsenhorn: dare i suggest a correlation between rushing into things that involve altered states of consciousness? or, would you say its any new hobby or project? Pema Pera: it’s perhaps a bit like breathing, fresh air in, stale/used air out . . . .
And then from 2 to 3. Pema Pera: the important thing is to get to stage 3: keep breathing! So often we take a deep breath in, then we exhale, then we give up . . . . writing in my experience helps the continuity, to not forget . . . .
Pema Pera: I have the impression, correct me if I’m wrong, that Maxine and Solo and Thor are somewhere around stage 2, and Fred is approaching 3, while Adams is reaching the end of 1 . . . just a guess, don’t want to pin down, but perhaps fun to reflect on? Pema Pera: and with what Maxine just said, she also crossing over into 3? Thorberg Nordlicht: you mean in terms of PasB involvement? Thorberg Nordlicht: I was more active for a week or two after discovering the group, but now RL has drawn me away for a few weeks so I haven’t been around as much recently. Thorberg Nordlicht: Also, I found that for a while, the only thing I did in SL was come here to see who was here, but now I’m back to doing other things in SL, also. Following Maxine’s summary, I tried to catch all three stages in one sentence. 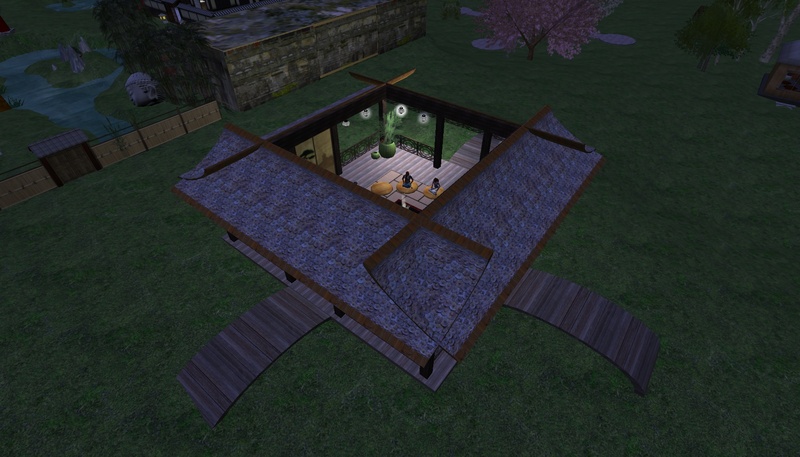 Thorberg Nordlicht: Time passes more quickly in SL. I find that a “period of interest” is shorter in SL, too. 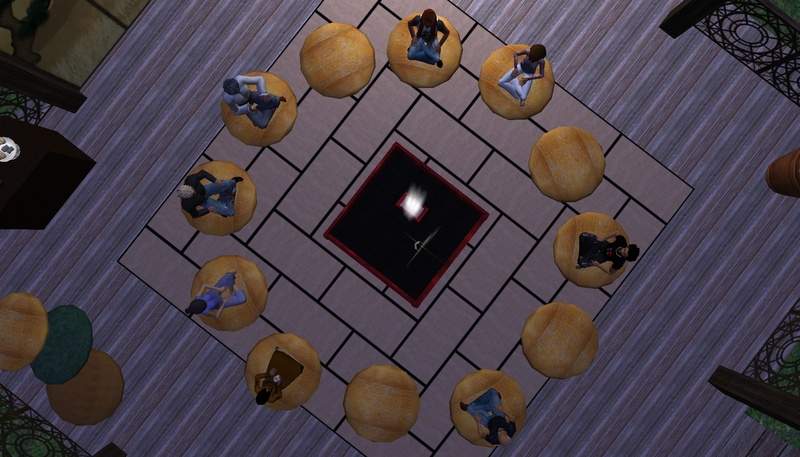 A sustained involvement that lasts a few weeks in SL seems the same as something that lasts a few months in real life. Pema Pera: the reason I am bringing this up, is to remind you not to be discouraged in stage 2 ! Pema Pera: yes, Thor, interesting, isn’t it! Pema Pera: and you then don’t realize that others feel the same, you think it is just you . . . .
Maxine continued to give a very open and direct report of her experience of what I had just called stage 2. I felt deeply touched by her description, knowing how helpful it would be for other participants, in the present as well as the future, for those reading these lines months and years and decades from now, or longer; how knows when . . .
Pema Pera: well, Adams, you only have yourself to blame :-) for putting such interesting stuff there — so honestly and genuine! Friedrich Ochsenhorn: i guess i was warned. splash. Pema Pera: shall we walk over to the new place instead? Solobill Laville: Well done Fred! Even though Fred had just succeeded to make himself comfortable, we walked over to the new spot. Adams Rubble: do I get abottloe of wine this time? Interesting idea, Fred, to extend the experience of the senses! We were all quiet for a while, taking in the new environment. Friedrich Ochsenhorn: anyway, these (long frequency) pauses are pretty essential to the creative process, as i understnad it. The Sabbath, if you will. I wondered whether the last word was an adjective, but it probaly was meant as a verb. Solobill Laville: May I share a quote I read yesterday? Solobill Laville: Mind can only observe itself. Pema Pera: Watch out now, Adams!!! I thought that Stevenaia had made Adams drink here, the other day, but it was whiskey he had handed out, not wine, it turned out. stevenaia Michinaga: am I standing on someone? Adams quickly got into the mood again :-). Solobill Laville: Has anyone noticed the moon above? Pema Pera: not our Moon? Neela walked in and joined us, and soon Dakini would follow. Maxine Walden: the moon with the rabbit in it? Solobill Laville: yes, carrying the basketball even! 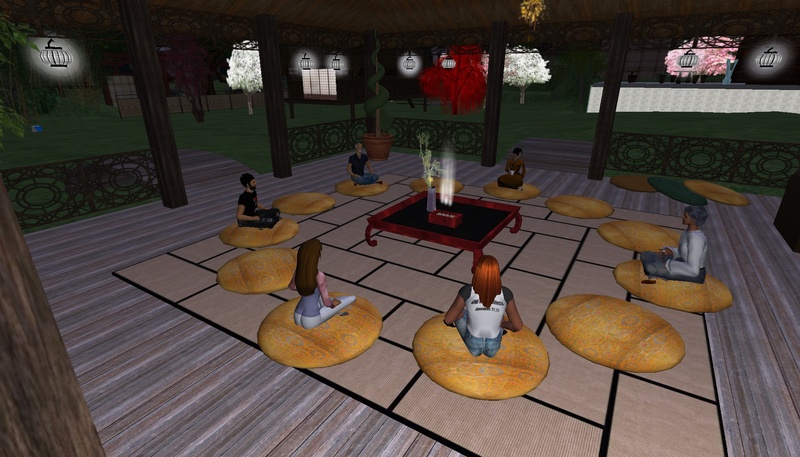 Maxine Walden: ah, his Dakini, we are so enjoying this lovely place!! A well deserved round of praise for Dakini. Maxine Walden: you thought they must be us? Neela Blaisdale: Where did Dakini go? Dakini Rhode: yes, i though the green dots were you! Neela Blaisdale: Yes that’s fine. The conversation turned on the wonderful child of the neighborhood, who had recently shown up. 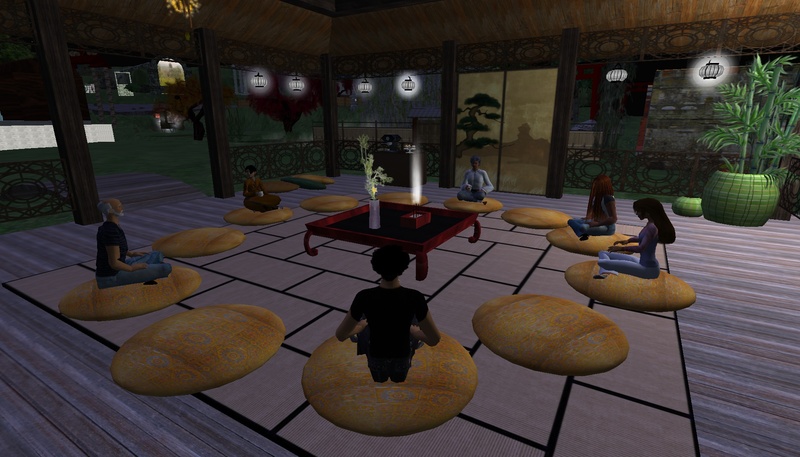 Pema Pera thinks he really ought to get up earlier in order to attend more zen sittings . . . .
Neela Blaisdale: What is the age for that? Adams Rubble: Which temple is that? I related my encounter with Shufei, a month after starting Play as Being. Pema Pera: Yes, I met her, oh, seven weeks or so ago, I now remember, and we had a very nice conversation, about the land here, and plans for creating rivers and forests. Dakini Rhode gave you The Cijian Temple (Daoist), Mieum (64, 116, 80). Solobill Laville: That sets a nice destination vs. journey imagery…yah forests! Pema Pera: Bye Neela, come back soon! 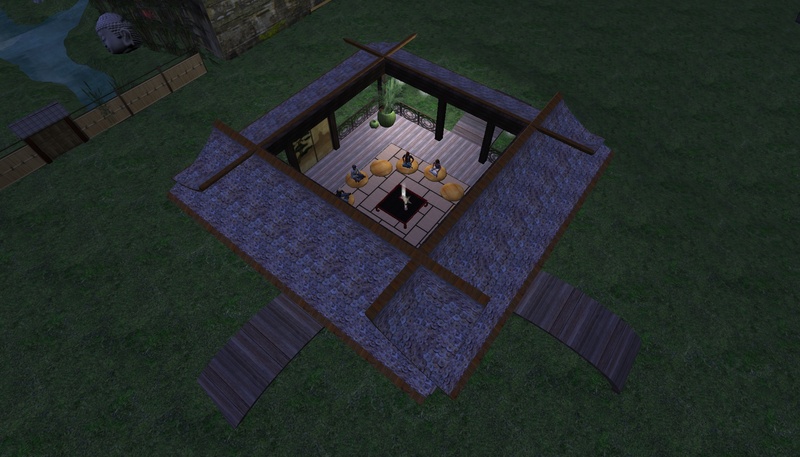 After Adams and Neela left, we started to reminisce about the tea house. 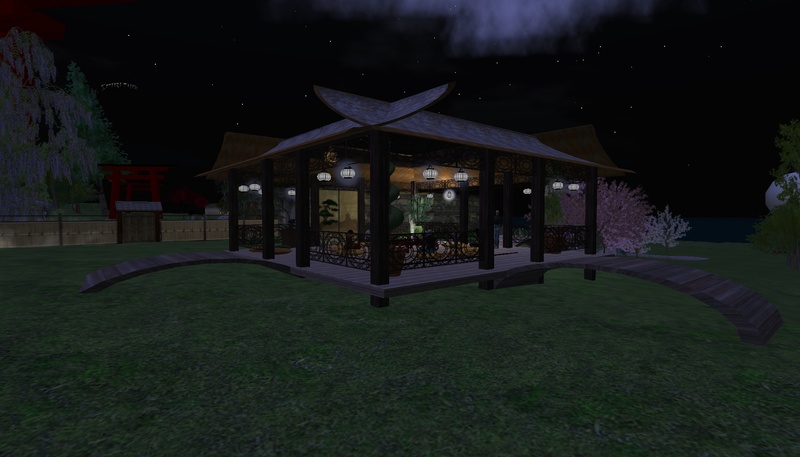 Pema Pera: Dakini, I remembered a conversation we had, about a month ago, when we began to realize that the tea house was getting too small for our group . . . and we both felt a bit nostalgic, and somewhat reluctant to let go . . . but I think you have created an equally splendid atmosphere here, easing the transition! Friedrich Ochsenhorn: it is a good quote, though I would take playful issue with the dis of the urban aesthetic. people go to the city and through the city all the time..
Dakini Rhode: maybe easier to let go when you know where you’re going…. Pema Pera: interesting statistics, Fred! Friedrich Ochsenhorn: um. anyone notice an even closer similarity of this place to the japanese tea clubs in Pema’s wife’s paper? Solobill Laville: But it is still great! Friedrich Ochsenhorn: ah. ok. still, uncanny. 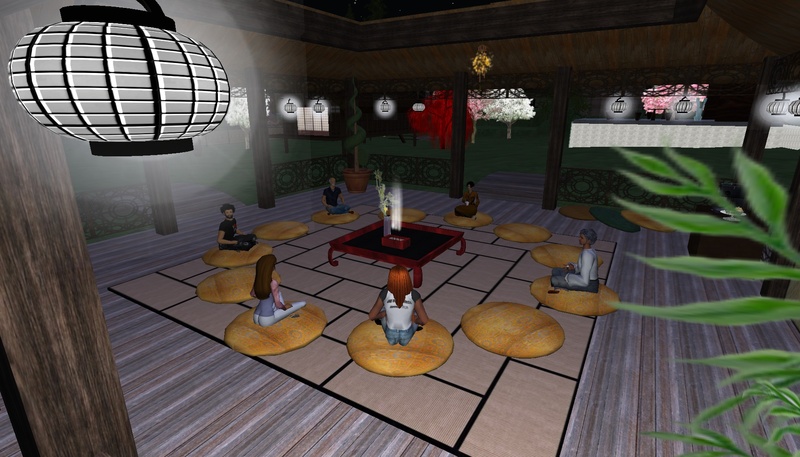 Fred, Dakini and others had referred to the paper “Avatars are for real: Virtual Communities and Public Spheres”, by Eiko Ikegami (Kiremimi Tigerpaw in SL) and me, to appear next month in the Journal of Virtual Worlds Research (JVWR), a new open-access, transdisciplinary, peer-reviewed online journal. Solobill Laville: Fred, do you know, of the “over 50%”, what % live in squalor? Friedrich Ochsenhorn: not offhand, sorry, but i can try to dig up a source. Solobill Laville: Well all, I’m going to take a pre-dawn constitutional! Solobill Laville: Good bye until the next time! Dakini Rhode: the space, Pema? Amidst the many goodbyes, Dakini and I continued to talk about the new place. Stevenaia joined us in considering options for furniture. Pema Pera: what a fun evening!! Dakini Rhode: thank you Maxine! Pema Pera: we can have boat rides with wine and chees and candle light perhaps, on the broader stretches of our rivers? Pema Pera: sorry, Steve, what do you mean? Pema Pera: a little pond? Pema Pera: yes, no single solution! Dakini Rhode: ooh little fish bowl on the table? Pema Pera: Thanks again, Dakini! Dakini Rhode: in the table!